Wellness is on everyone’s minds as we come up to the New Year, with resolutions at home and work being made. Promoting employees’ good health, well-being and mental health should always be at the top of company’s agendas. For 2018, there are various well-being trends and initiatives that employers can implement in their office space to promote the health of their staff. The majority of employees spend hours every day sitting at their desks. With 8 to 10-hour days common in many sectors, and with the pressure of deadlines and projects always looming, some people barely move from a sitting position all day. There is plenty of evidence to show that a sedentary lifestyle can be catastrophic for future health issues, and is bad for the body, brain and mind. Obesity, depression, anxiety and joint issues are just some of the common health problems associated with sitting too long at a desk. A simple and effective way to counteract this is to purposefully reduce the amount of time employees sit at a desk. Introducing sit/stand desks is an ideal solution, as it allows staff to vary their working positions. Encouraging breaks away from the desk and allowing staff to migrate to different working areas can also be an effective way to deal with the problems of sedentary working. Furnishing employees with tablets and laptops increases their potential for mobility in and out of the office. This seems unlikely to many people, as napping on the job is generally frowned upon. However, studies show that a 20-minute power nap can be hugely effective in increasing productivity and reducing stress levels. Forward thinking offices are incorporating sleep pods, rest rooms and policies allowing naps into their workspace design. As with many initiatives, tech giants like Uber and Google are leading the way in these kinds of pioneering ideas to help employees work to their potential, and enjoy their jobs as much as possible. The work culture today is one in which employees are constantly connected. It can feel difficult, if not impossible, to switch off smartphones and stop scanning emails at the weekend. Having blurred boundaries between work and personal time is counterproductive in many cases, and leaves employees burned out. Designing office space with breakout areas free from computers gives employees the option to take digital breaks throughout the day. The design and layout of the office space can’t be underestimated in terms of encouraging better health and wellbeing for employees. 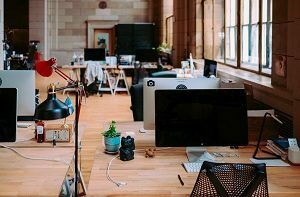 Smart use of space and the creation of private, quiet areas in an open plan office can have huge benefits for productivity and workplace happiness. The health and wellbeing benefits of including greenery in the office are mounting all the time. Studies show that plants improve not only the physical health of employees, but also cognitive and psychological elements. Many offices have vending machines or snack options for employees needing to quickly refuel during busy work times. However, the food on offer is often processed, full of sugar and bad fats. All of which provides only a short term burst of energy and can be detrimental to overall health and wellbeing. Employers can now work with innovative businesses all around the UK who are working on creating healthy options in vending machines. Incorporating something as simple as healthy, preservative-free snacks for employees will improve mood, concentration and endurance. This entry was posted in Commercial and tagged 2018, Fortitudo Ltd, Richard Carr, Trends, Workplace by Richard Carr. Bookmark the permalink.